Sea-level is such an arbitrary starting point for measuring the height of a mountain. If you ignore it then the tallest mountain on earth is not Mt. Everest but rather Mauna Kea on Hawaii, “the Big Island.” Mauna Kea is 13,796 ft high starting from sea-level with another 17,000 ft extending to its base below the ocean. You'll excuse us for not starting our climb from the base! And hopefully you'll also excuse us for not starting from sea-level either. The best strategy is to start from Hilo on the east side (shorter route, less traffic) on a mountain bike, because there is a 5k unpaved section near the top that is nearly impossible to negotiate with a road bike. Our beach house was on the west side, so we drove our car part way up on the busy roads towards Mauna Kea. The traffic thins after the turn onto Saddle Road, an old military road recommissioned for civilian duty. It's beaten up and poorly converted from a one-laner to two lanes by simply paving over the dirt shoulder on each side. Apparently, it's “the most dangerous road in Hawaii”, but that may have more to do with the Army artillery practice that takes place nearby. Saddle Rd bobs and weaves for 26 miles until you reach the top of the saddle -- the cleavage between the tallest mountain on earth, Mauna Kea, and the largest mountain on earth, Mauna Loa. Mauna Loa means “long mountain” for its gentle but long slope to the peak. It's considered the largest mountain for its staggering 10,000 cubic miles of rock... and I mean staggering because it can't support its own weight and continues to compress. 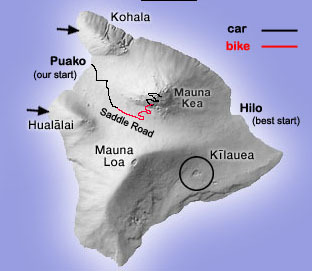 We drove up Saddle Road and parked at the Mauna Kea State Recreation Area which would give us a 7 mile warmup before the 6 mile climb to the Mauna Kea Visitor Center where the road turns to gravel. Since the traffic was light on Saddle Road we could easily avoid the rough pavement on our bikes. At 6500' elevation, the landscape was already quite barren, with views reminding us of Death Valley. The climb up to the Mauna Kea Visitor Center was 6.2 miles, going from 6700' to 9200' for a gain of 2500 feet. It felt like a tougher climb than it looks on paper because our last memory was of the lung busting 250 meters, 17% grade at 9000'. The next 5 km is very steep and unpaved which a few people have (apparently) climb and descended on a road bike; however, this photo shows you how loose and rutted the dirt road is. We considered hitch-hiking our way to the top but instead decided to descend to our car and drive up to the top. After returning to the vistor's center with our car we locked our bikes up outside so they wouldn't get covered in dirt and knocked around on the back the of car. The second half of Mauna Kea was much steeper than the first: 6.6 miles going from 9200' to 13500' for a gain of 4300 feet. While fish-tailing up the steep, gravel switch-backs in first gear, I kept one eye on the road and one eye on the spectacular Mars-like scenery. Up, up and up we went driving the stairway to the heaven well above the cloud line. Mauna Kea, like neighboring Mauna Loa, is a shield volcano, characterized by lava pouring out layer upon layer for millions of years without an explosion. In contrast, a volcano like Mt. St. Helens is known as a composite volcano which violently explodes during eruption. The most recent Mauna Kea eruption was about 3,500 years ago so it's now considered a dormant volcano, but it will, apparently, erupt again someday. Mauna Loa, on the other hand, is active and last erupted in 1984. The Hawaiian name mauna kea means “white mountain”, a reference to the fact that it is regularly snow- or frost- capped during the northern hemisphere winter. The mountain including the summit was originally part of the legendary Parker Ranch -- the largest privately owned ranch in the U.S. Today, the summit hosts a herd of observatories. The Mauna Kea Observatories [aerial-photos] make up the world's largest and most sophisticated facility for studying optical, infrared and submillimeter astronomy. Among the billion dollars worth of internationally owned and operated observatories is where we parked and hiked around admiring the incredible scenery. It's not surprising that astronauts train here practicing lunar landings. With so much invested, scientists have obviously done a good job convincing their governments that the volcano is not going to erupt again anytime soon. The whole world wants a piece of the action because the summit is above approximately 40% of Earth's atmosphere and 90% of the water vapor, allowing for exceptionally clear images. Believe me, the clarity is very discernible to the naked eye. The combination of vivid colors, out-of-world scenery and clarity is simply shocking. Would it be too corny to say, you won't believe your eyes? Although some 80 miles away, we had a decent view looking down on Haleakala, the highest point on Maui and almost 3000 feet lower. 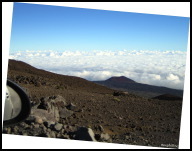 The Mauna Kea summit is well above the inversion layer, allowing up to 300 clear nights per year so day or night the view from the top of Mauna Kea is one of clearest on the planet.